Socks, this time for hubby. A simple rib, designed by me just to keep it interesting. 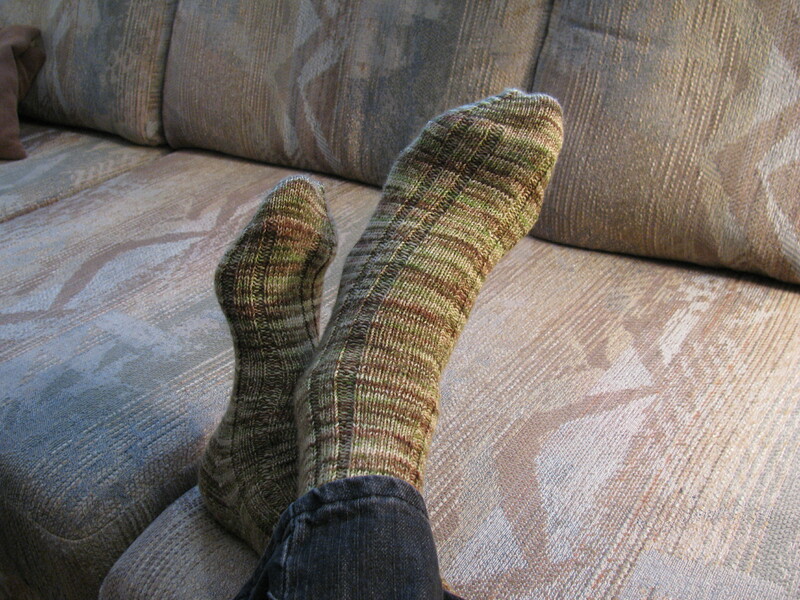 I bought the wool in Nanaimo, and started them for myself, and decided that they were not calling my name. So cast on for a larger size. Nice wool to work with, and they took about a month to complete. Size 2mm needles, and 68 stitches. Pattern: my own* K5,P2,K3.P2.K5*repeat 3 times per row. Yarn: Regia Extra Twist Merino Color premium line green and brown. My goal this year is to knit socks for my family and not so much for myself. I have a new piece of art. This figurative post was found at the Seymour Art Gallery show and I had to have it. Lloyd Skelton is the artist. 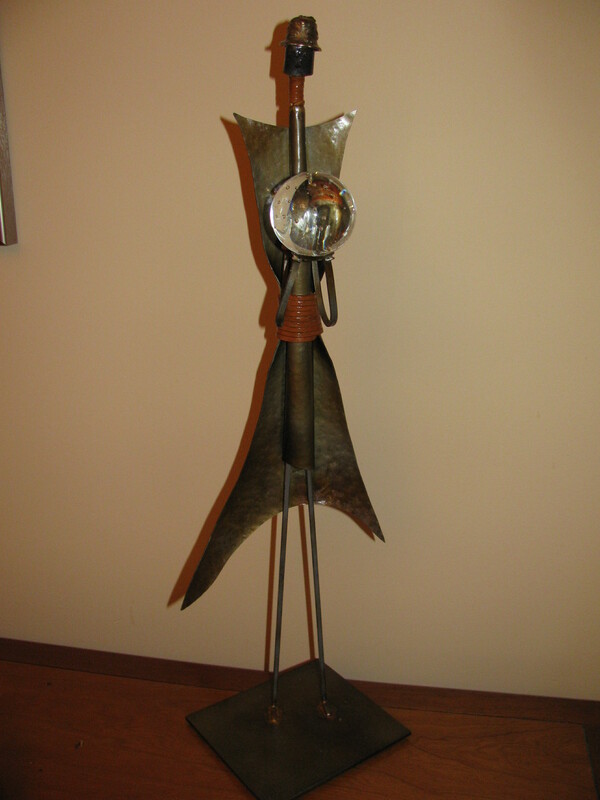 Another artist in the show was Melanie Thompson, I had one of her lamps, purchased last June when I was on Salt Spring Island. I have the lamp on the right made with cedar.This lamp gives such a warm glow to my dining area. I have had trouble with these links, this is my 3rd try at them, if they don’t work. Just leave a message and I’ll email you a link. It’s a Wrap, isn’t that a great title for the latest crusade #47 at Green Pepper Press? This time it is about gathering evidence from Christmas. We were to document papers, gift wrap, cards, lists, memorabilia. 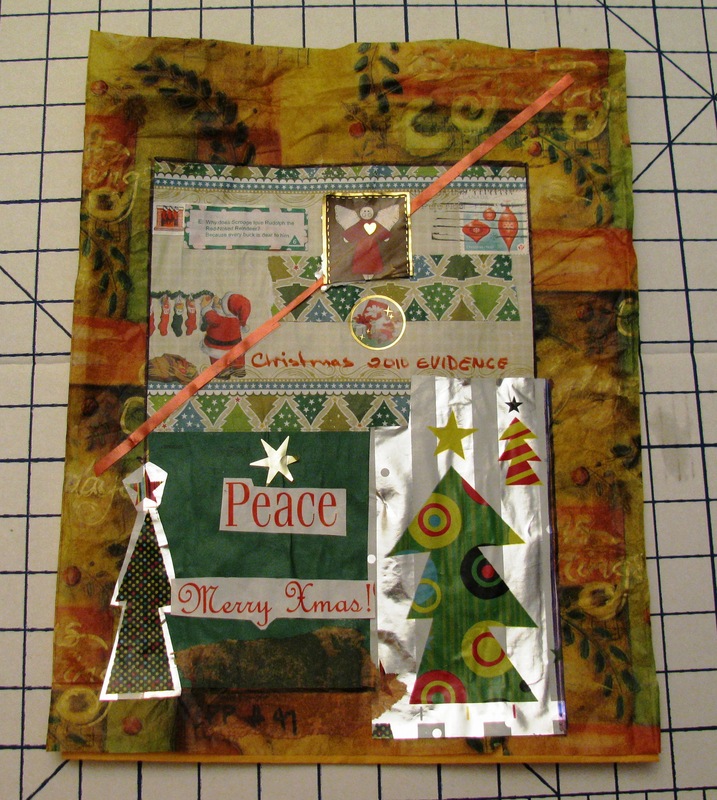 I usually reuse the same bags and fabric wrappers to wrap my Chriatmas gifts each year. This year it was unlabelled as well. I grouped each persons’ gifts together in a pile. But I did save a couple of things this year, so I was able to take part in the challenge. I had a couple of neat papers and an envelope that I didn’t want to throw out. The joke from a cracker, a couple of stickers, part of a paper napkin, a little ribbon and went to work. 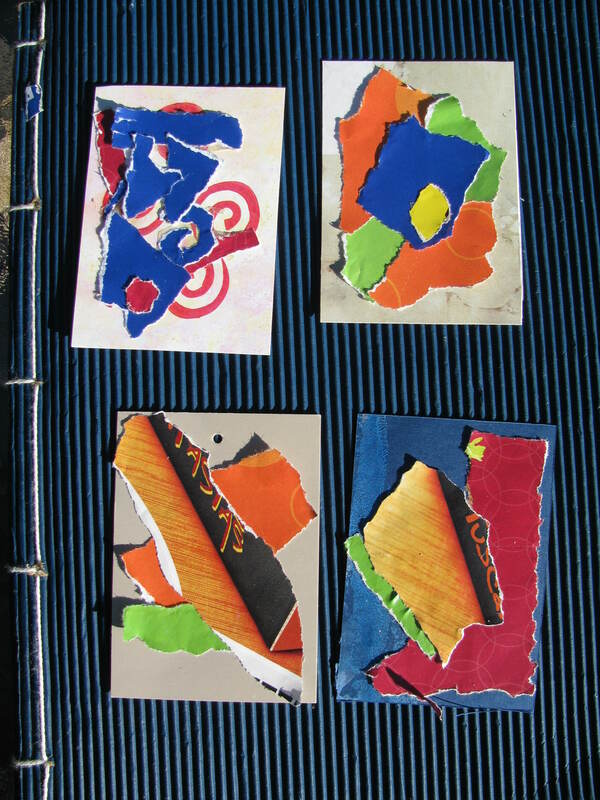 I had a large used envelope and glued the materials down with matte medium, the envelope could still hold other memoribilia of 2010. Thanks Michelle, I so look forward to the challenge each month. Do you groupon or swarm jam? I have been getting the offers from groupon now for a few months. I have only bought a couple of things. Each day you get an email with the latest offer on a meal, event, attraction, service or product. You pay for the coupon and get a good precentage off the regular price. It might be online or a coupon that you print and take with you. It is available for a lot of different cities. There is a tipping point, a number that they have to have before you get the deal. I like it better than coupon books, I’d never remember them, or there would be a bunch of stuff I didn’t want. I am not meaning a new scarf, but jewellry. Stone necklaces do keep me warm though, I don’t know why. I got a new bradelet from my oldest son, and like last year, he said to wear it as is or take it apart and do what you want. So last night I played and got so inspired, I worked on two necklaces. 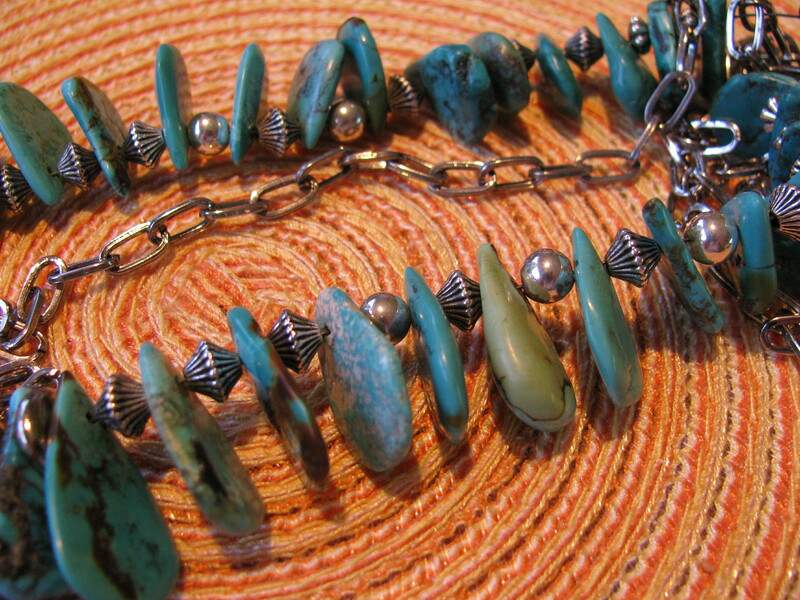 One with my new turqouise beads with different silver beads in between and it is to be finished off with a chain. I did buy the chain today. Now it is Tuesday night the chain is in place but I am considering adding another couple of pieces to finish it off. Here it is in progress. 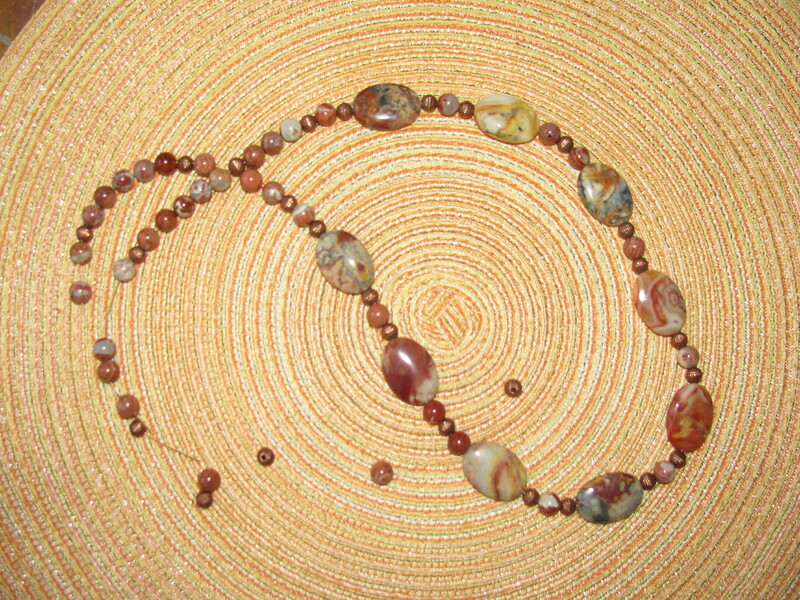 The other stones have been in my possession for three years or so, a fancy oval agate from Toronto and small round jasper beads. While rounding up my supplies for the first necklace, I found some small copper balls. I am liking them both, now to finish them off. I also have some red coral , some blue dyed coral discs and a few other pieces that I puzzle over. I am sure the right bead will show up, but red and white isn’t doing it for me. It is just too much like a candy cane. As the holiday season winds done, I am all ready to tidy up put things away. I clean out the fridge, make soup, rearrange cupoards, make lists, put away the Christmas stuff and start to make plans. A new year gets me excited, I guess in some ways I like to get back into some sort of routine. When you are retired it is easy to just mill about but you can miss out on too much if you don’t make plans for something. September gets me geared up as well, usually in regards to the countdown for Christmas. Last year, I enjoyed the challenge of the crusades and my online art class with Suzi Blue. So I want to consider doing those again but I’ll up it a notch or two and try doing the arte journal this year. 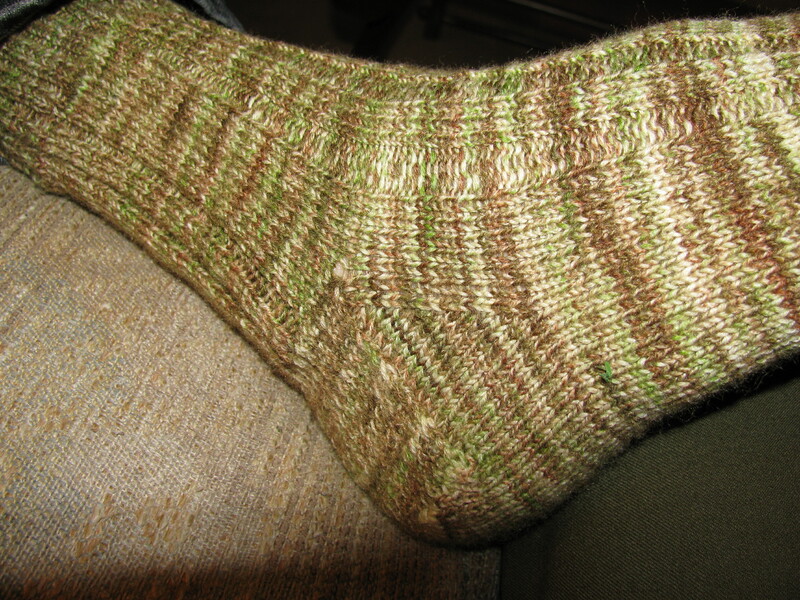 Project yarnway on ravelry, more of a failed attempt than anything but I did discover that I enjoy making socks and working out simple patterns for meyself. Sewing I really didn’t follow through very well with that idea, I wonder why because I still love fabric and thread. Doll making has been very limited and I think will continue at a slow pace of one or two dolls a year. I bought tools for jewellry making and I will work on a few more items this year. My word last year was awareness, I tried but truly ate too much( I was aware of what I was doing (that didn’t stop me)) I walked more, discovered lots of things on my walks. Started reading more again. I am trying to use up and recycle what I have. I think my word for next year will be “Connection”. I have always like the connections between people, places and things. I have always like the idea of working with themes. So it will be interesting to see where the connections lead me. If project spectrum runs thhis year, there was a year off last year, it will be fun to join it to a crusade or arte journal post as well. In 2010, there were 68 new posts, growing the total archive of this blog to 382 posts. There were 140 pictures uploaded, taking up a total of 537mb. That’s about 3 pictures per week. The busiest day of the year was February 26th with 66 views. The most popular post that day was About. The top referring sites in 2010 were michelleward.typepad.com, beebeepastiche.blogspot.com, fiberartsafloat.blogspot.com, 1seamatatime.blogspot.com, and blogger.com. Some visitors came searching, mostly for http://www.fabricfan.wordpress.com, six piece wardrobe, butterick 5277, burda 8280, and fabricfan.wordpress.com.